Murder seems to follow a Denver stand-up comedian who ends up playing the part of an amateur sleuth in Sternberg’s (Cobalt Blues, 2016, etc.) collection of three mystery novellas. Izzy Brand is an aging comic who still does stand-up gigs on a regular basis. 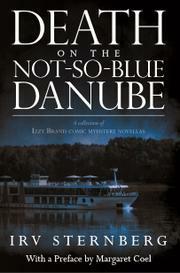 In the title story, the book’s longest, he’s on a relaxing 12-day cruise on the Danube with his companion, Anita Bender. Unfortunately, a dead body turns up in the ship’s library, and Izzy thinks that he’ll be the primary suspect, as he was with the victim less than an hour before the murder. With his detective pal Carlos Collins sick from food poisoning, Izzy takes it upon himself to investigate before the police arrive. The comedian, who solved a friend’s murder years ago, narrows down a list of suspects, most of whom hated the victim—but then a second corpse turns up. In The Mayfly Murder, Izzy once again becomes a gumshoe while fly-fishing on the Arkansas River. A small group’s excursion is interrupted when one of them apparently dies from a fall, but later evidence points to murder. In the concluding Cobalt Blues, the instructor of Izzy’s oil painting class dies mysteriously, and the comedian is once again on the case. Sternberg’s protagonist is much like a modern-day Hercule Poirot, which makes the occasional references to Agatha Christie’s work appropriate (such as the satirical title). Izzy is highly observant, and his first-person narration clearly notes relevant details, such as a missing bookend in the library. The best scenes, however, involve Izzy questioning others. His dialogue always feels organic to the situation at hand, and in Cobalt Blues, he believably disguises a series of inquiries as a mere lunchtime conversation. Readers are also treated to bits of Izzy’s genuinely amusing stand-up comedy. His profession, however, isn’t often incorporated into his investigations, during which his jokes have a cynical edge. Short but diverting whodunits featuring a laudable part-time detective.